Here, from a late-era Preview 45, is one of my favorite singers, Gene Marshall, offering up the lament of so many Americans of that day, the “Watergate Blues”. Although the lyrics (supplied by Ernestine Gee) are clunky in places, there are some pretty good turns of phrase here and there, and I think maybe someone could have cleaned this up a little and made it into something, if that was the business they'd been in. 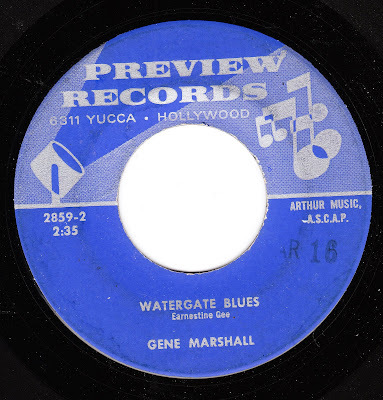 Either this one was played to death, or (more likely) it’s just an example of the dreadful pressings produced by Preview near the end of their run. Hopefully, the poor sound won’t impact your enjoyment of the performance. 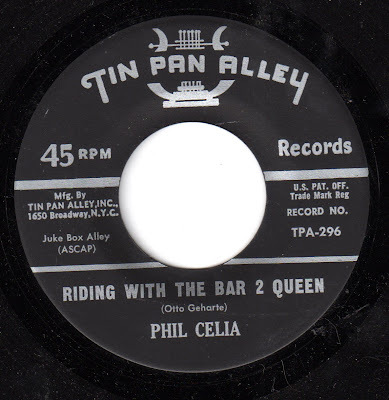 I haven't offered up nearly enough of Phil Celia's records here. I think they are, in their own way, just as unique and interesting in sound and performance as Rod Rogers Film City records or Norm Burns Sterling label releases. 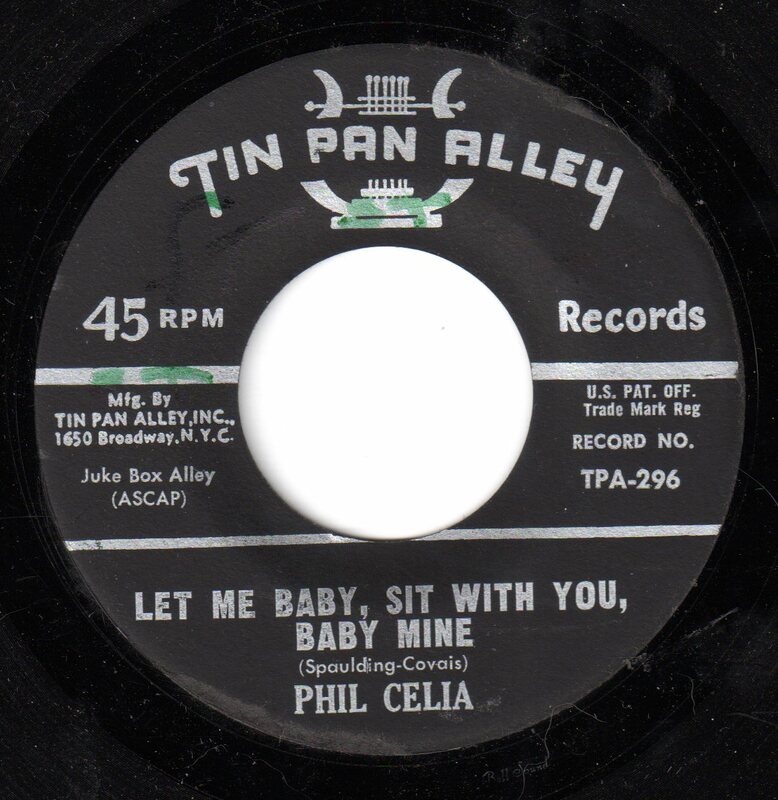 Here's an ideal example, a song-poem containing the clunky title of "Let Me Baby, Sit With You, Baby Mine". A nice swing combo provides the fast moving backing, while Phil offers up a winning vocal. A nice piano solo follows, then, this being a song poem, there's a nice little error, in which the band and the singer clearly had different ideas about how many times Phil was going to sing the final phrase, with the band heading for the end of the song before he gets there. No second takes in the song-poem world. For a second straight week, here's one whose history and link to the song-poem field is more than a bit blurry. As with "Friendly Melvin", this record is certainly worth hearing, and the evidence is that it's a song poem. 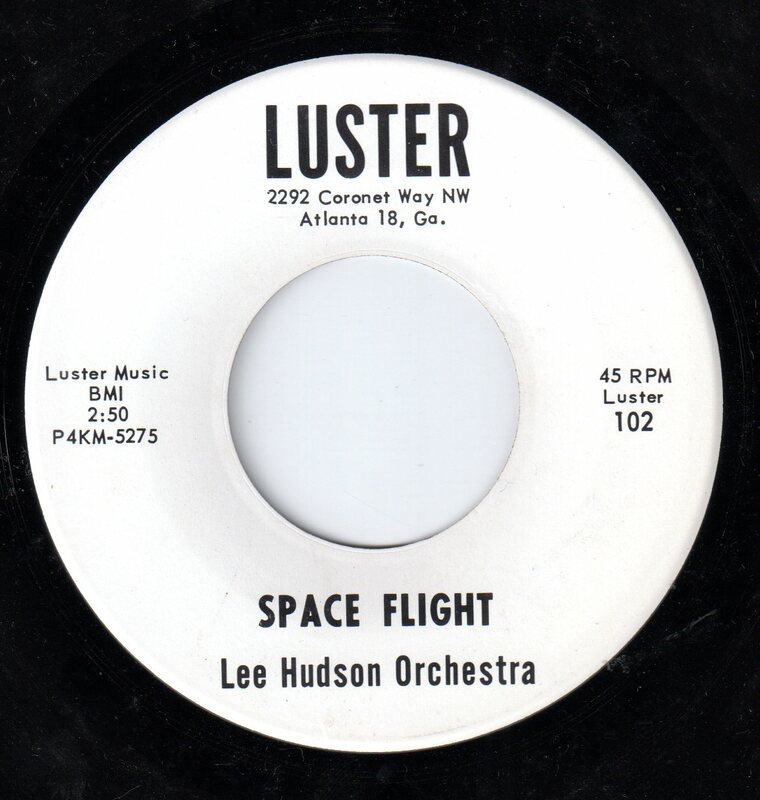 The presence of the name "Lee Hudson" caused me to purchase this one, unheard, due to the fact that a certain Lee Hudson was a central figure in the song-poem field in the 1960's. I bought even though that name is far from uncommon, and even though the name "Bob Brown", as a song-poem artist is unknown to me. 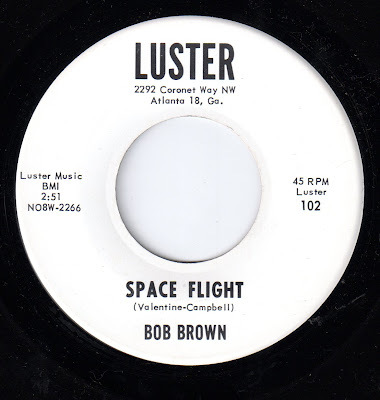 The Luster label is not listed in the AS/PMA website, but on the other hand, there are records by a "Bob Brown" (again, hardly a rare name), and not only that, those Bob Brown records appeared on records with a Lee Hudson connection. 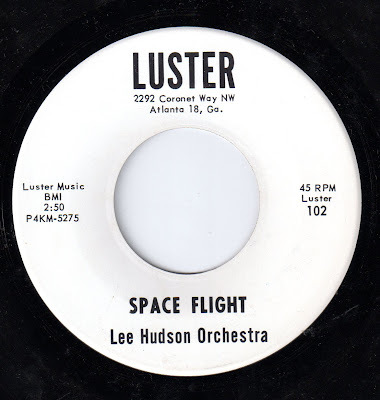 That brings us to the record in question, "Space Flight", which certainly has many of the hallmarks of a Hudson production, from the thick string arrangement to massed backing vocals which (mixed low though they are) sound a lot like Cara Stewart (along with some male singer) to me. 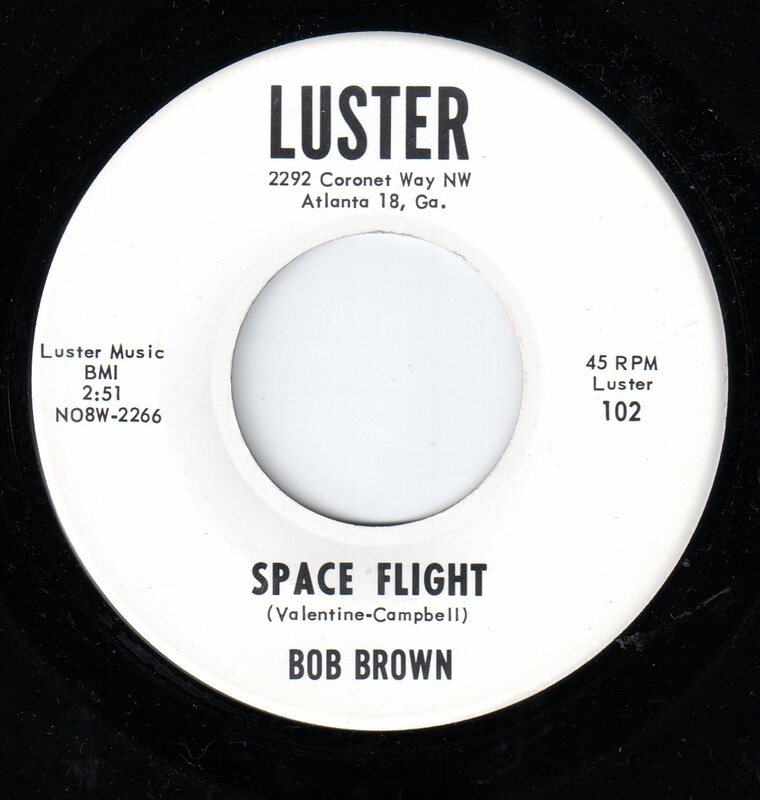 The song itself is a wonder to hear, a veritable composite of many of the thoughts about space exploration which might have been heard during the 1960's. 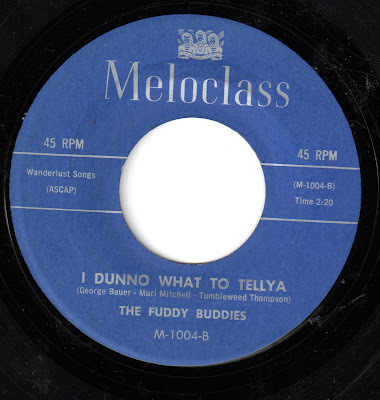 The flip side, in a real rarity for a song-poem record, is an instrumental version of the a-side, with piano taking over the melody, in the best Roger Williams style. Today, another one of those records - and it's been too long - that I get done listening to and immediately say "I've Gotta Hear That Again Right Now!". And to be honest, I have no idea where in the song-poem/vanity/unexplainable universe this record came from. A little sleuthing on the AS/PMA website shows a definite connection between some of the releases on this label (Meloclass)and other song-poem labels and acts, and the B-side (see below) sounds very much like a song-poem to me. What's more, that b-side involves some of the same people as this A-side, including the fabulously named Tumbleweed Thompson. 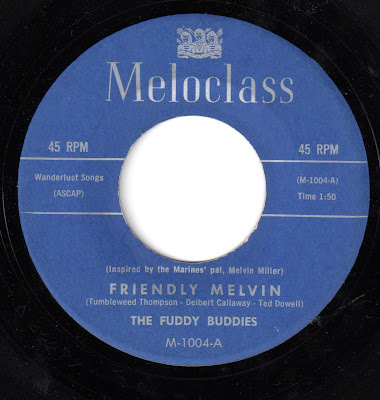 But this song - "Friendly Melvin", credited (as is the flip) to The Fuddy Buddies, sounds too thought out, too deliberately weird to be a song poem. Then again, so does "Hydrogen, Nitrogen, Potassium", which is clearly a song poem. Anyway, this one, which may be the weirdest song-poem listening experience I've had since I found Jim Hall's version of "Hydrogen...", grabs me right from the start, with a startling open five second blast of organ, drums and trumpet, and continues with that wonderfully odd, slightly off kilter backing arrangement, while a trio of slightly drunk sounding guys, with just the slightest of midwest ethnic accents, sing a song "inspired by the Marines' Pal, Melvin Miller". Really, who among us wouldn't want to have all of our woes punched in the nose? On to the flip: Despite being credited to the same "Fuddy Buddies", the B-side, "I Dunno What to Tellya", sounds very little like the group on the A-side (although that title sounds like something the boys on side one might say). But in this case, there's a female lead singer, piano replacing the organ. guitar replacing the trumpet and minimal presence of drums. As I said above, this one sounds exactly like a song-poem. 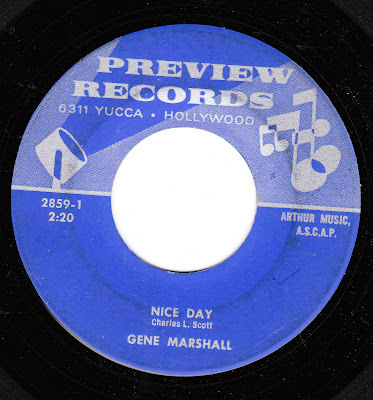 Oddly enough, this second song - with the same label number - was released on the same label, paired with a different flip side, by a different group, a song which had a non-matched label number (1002-B), and THAT other flip side also appeared on yet another 45, paired correctly with the other song labeled 1002-A. This EP contains three songs from the Film City label, and one from the Globe Records factory. The first two songs feature Rodd Keith, as Rod Rogers. 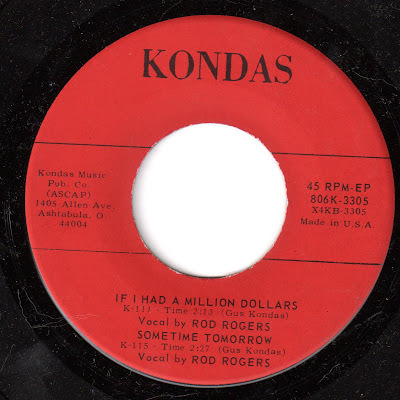 I particularly enjoyed the leadoff track, "If I Had a Million Dollars", because it contains not only the relatively rare feature of Rodd harmonizing with himself - a nice sound - but it briefly features three Rodds singing together at once, something I've only heard on a few records. And of course, it's got that great Film City Chamberlain sound, one of my favorite musical sounds in the world. The flip side starts off with a samba type song titled "If I Ever Needed You (I Need You Now)". I have little doubt that that's Rodd playing the Chamberlain, but the identity of the singer is eluding me. He sounds familiar enough that I know I've heard him before, but the name he is given here - Gene Acres - sounds like a joking reference to "Green Acres", and to my knowledge this name has never shown up on another documented song-poem record.